Ever since Mark Ronson released his catchy song “Uptown Funk” last November, everyone around the world has been more or less addicted to its exciting beats and lyrics. Since that release, the song’s music video has garnered over 750 million views; that’s nearly 10% of the world’s total population! And with such a huge amount of people listening to the song, it’s no wonder that so many videos have been released from people trying to emulate the suave styles of Bruno Mars et al. In fact, all sorts of people have added their own twists to the hit song! Whether it be dads singing the song with their kids or huge, unforgettable graduation ceremonies, one thing is for certain: Everyone loves this song. 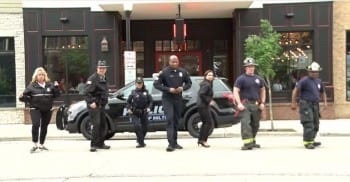 To add to the mix of self-produced musical video masterminds, the first responders of Rock County, WI have added their own public safety lip dub as well, and it’s sure to put a smile on your face. We just love the passion and energy that these local heroes bring to the table. We certainly admire their spirit and dance skills! Along with the firemen and police force, we love the special cameo visit at the 1:09 mark. Please SHARE this hilarious video of our brave men and women letting loose and having fun!